Following on from the fancy festive gift wrapping at the start of this month, Club Nintendo Australia’s latest catalogue item is a selection of coloured charging cradles for the 3DS XL. Released in Europe earlier this year, and both Japan and North America last year, the coloured changing cradle has now washed up on Australian shores. Available in five different colours for 2000 stars each, this dock is sure to satisfy 3DS XL owners' charging needs. If you’ve ordered, or previously acquired one of these docks, let us know in the comments what colour you went with. The docks are really uncomfortable if you want to play games and charge with it. Especially smash 3ds, it's unplayable. I would think playing on ANY cradle would be uncomfortable... they are not meant to be used when playing, you would just plug the cord in the 3DS for that. Aw, at first I thought this was for America... I miss the cradle for my original 3DS, and would love one for my XL, but when NA got these they sold out almost instantly and I didn't even have an XL at the time. I found the yellow one in a local preowned games and DVDs shop and it worked fine the first couple of days I used it and then my 3DS XL wouldn't work with it at all after that but strangely enough when my friend tried his 3DS XL on it it worked like the first day I had it.He bought it off me in the end because I had no use for it.I think the little gold pins on my 3DS XL are faulty and I didn't use them at all before I got the cradle. @danielflugt Yeah, you would think somewhere in the article they eould mention if they were compatible w/ the new 3DS or not. 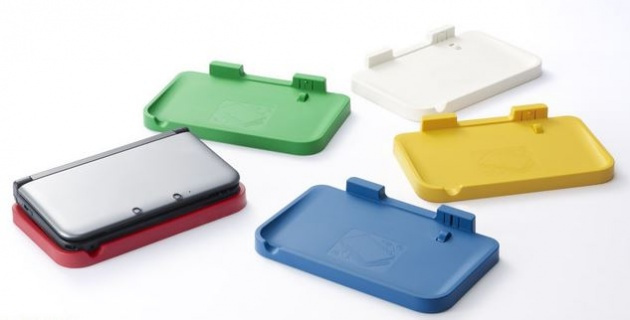 Charging cradles are available via retail for both the New 3DS and New 3DS XL though. @ikki5 The cradle's price is 2,000 stars & we get 200 stars per game so it's 10 games. Either Wii U or 3DS. I blew all my points on the MK8 pin set so I don't have anywhere near enough points to get this. I don't use my original 3DS XL much now I've got the New 3DS XL anyway. Hopefully I can gain enough points to acquire one before they disappear, but 2 colours are gone already. I remember when these were in the NA club. I wanted to get one, then I remembered I never use my cradle. No thanks Nintendo, I already moved onto the new 3DS. I also already have a black 3DS XL cradle since they were available to purchase from customer support. wait... I understood it was 250, unless it is 250 is Europe and only 200 in Australia. The faq for Europe shows 250 stars for both Wii U and 3DS which would be 8 games so why would Australia get 50 stars less? @ikki5 I don't know why, only Nintendo knows. It's just how it is. We get less stars per game but we also pay less for rewards (sometimes). For example, the price for the MK8 pin badge set is 4,000 stars in Europe but only 2,500 stars in Australia. I know the cradle was useless, but I still liked using mine. I want one of these for my XL. I got mine last year, I went for red as it went with my gold Zelda 3DS XL ... But as they say better late than ever ! !